Aladdin Books, c1953, 48 pages. GOOD+ Condition Illustrated Hardcover. This book is ex-library with usual markings, library binding, light cover wear(see Scan) & light reading wear. Pages & Binding are NICE & TIGHT! 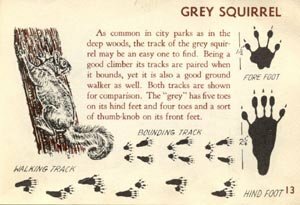 This book gives information and Identifies Tracks and Trails of Dogs, Cats, Painted Turtle, Raccoon, Birds, Snakes, Grey Squirrel, Chipmunk, Possum and MORE!! Payment must be received within 10 days of the end of the auction, unless other arrangements are made. Buyer pays $3.85 Shipping in Continental U.S. Checks held till clear. Money Orders shipped on receipt. Buyer Must Request Insurance at Additional Expense. IL residents add 7.25% sales tax.